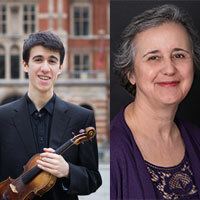 Our opening concert features two highly skilled artistes, Emmanuel Bach (violin), and Jenny Stern (piano). Emmanuel has a very prestigious musical career, obtaining a double first in Music from Magdalen College, Oxford and an RCM Artist Diploma. He performs throughout the globe, and is supported by many notable Trusts. Jenny has an equally impressive career path, studying at the RCM, and then completing her Masters in her home country of South Africa, winning the prestigious Emma Smith Overseas Scholarship. Jenny has performed in excess of 500 concerts, has performed on radio and television across Europe and has been invited to give many masterclasses. We look forward to welcoming you at our first concert, where there will be an opportunity to have a glass of wine, and engage with the artists.